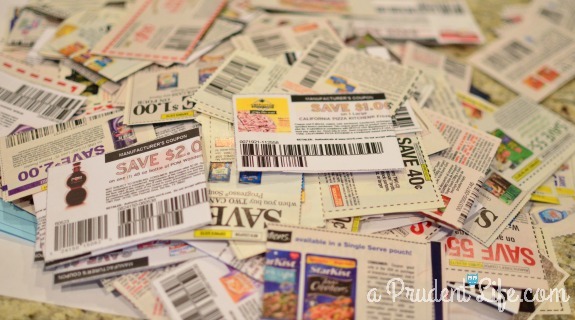 One of my favorite ways to save money each week is using coupons at the grocery & drug stores. I’m no extreme couponer, so this post won’t help you stock up on 872 bottles of Lysol. However, it should help you maximize savings on products you already buy without spending time you don’t have! 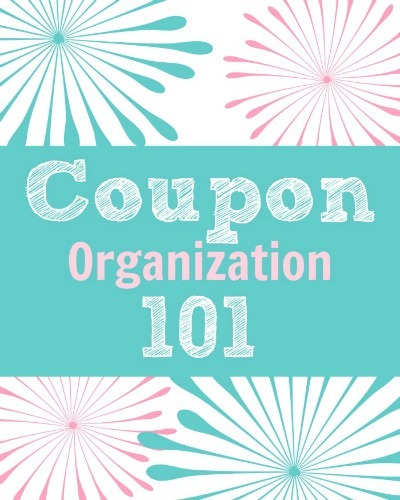 There are three main systems I’ve seen for organizing coupons. 1. Full inserts – Some people have great success filing the full coupon inserts by date and don’t clip anything until they need it. I tried this and it didn’t work for me. I like to have all the coupons at the store in case I forget that we need toothpaste or I see something on clearance. 2. Divided envelopes – I think I just wanted an excuse to buy these pretty divided envelopes, so I tried to convert to using them instead of my binder. I thought it would be great to just keep these in my purse. Total coupon fail. I couldn’t see everything easily and they were way bulkier than I expected. 3. 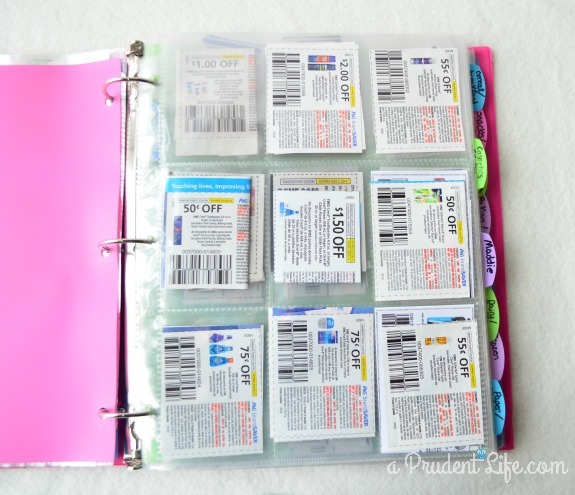 Coupon Binder – The best method I have found is using a binder, dividers, and clear trading card inserts to organize my coupons. Before I go to the store, I can easily check the binder against my list and find any coupons I need. I also take the binder to the store, which has led to some awesome deals! I recommend arranging your dividers in the order of the store you shop at most frequently. As you can see, your labels don’t have to be fancy. I just used a Sharpie. It’s more important to make sure you can read your labels without squinting! 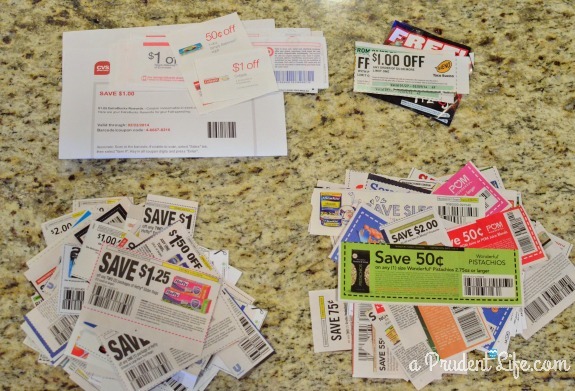 I only cut out or print coupons for products that I really think we will use. When this is done once a week, it doesn’t take very long to stay on top of it. You clip out what you need and then slide it into the right section. If you are starting with a neglected mess like I did, attack it systematically. I went through the inserts that had piled up, along with the ineffective coupon envelopes and dumped everything onto the counter. Be warned, it was SCARY. The big pile was overwhelming, but it didn’t take long to do a quick pass, checking expiration dates and dividing the pile into food & non-food. The other two piles shown were store specific coupons & restaurant coupons. I tackled each pile, matching up duplicates & arranging the coupons into the categories of my dividers. Once that was done, everything was inserted into the binder. When I have to fold a coupon, I make sure the expiration date is on the front. This makes maintenance easier at the end of the month. I also try to keep like items together within the sections. So, in the personal care section, all the men’s shaving items are on one page. Once my binder is set up, maintenance is easy as long as I stay on top of it. At least once a month, I do a quick glance at each page, removing expired coupons. I also flag or pull out any coupons for staple items that are close to expiration so I remember to use them during my next shopping trip. I am SO relieved to have my binder back in fighting shape! I need to switch to a full sized binder like this! I’ve been using a mini binder but it just doesn’t hold everything. 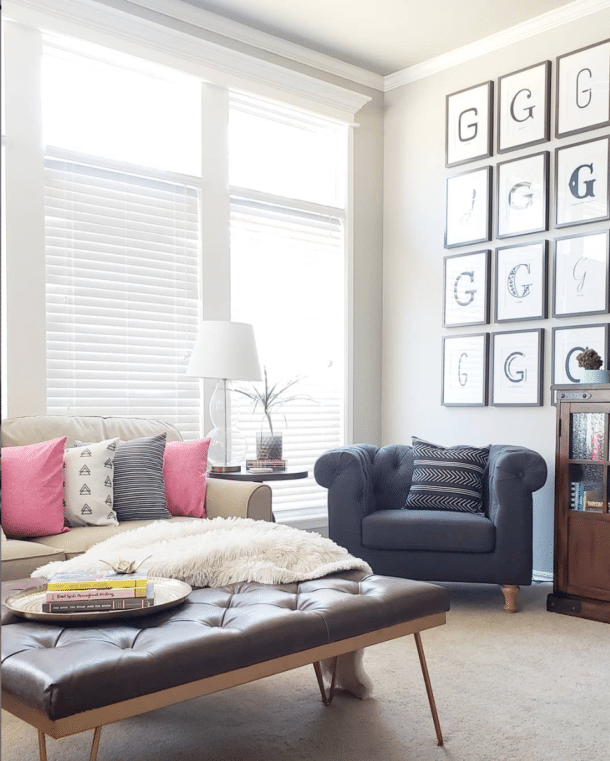 Great post and I love your categories too! Thanks Amanda! I really missed the full size binder when I wasn’t using it. I think you’ll love it if you make the switch. I probably should start couponing again. I got some great deals, but I ended up buying things we didn’t actually need or use. Idid have one heck of a cereal supply once, though;) I need to dial it down like you do and only clip or print coupons for things we will use. Thanks for the helpful tips! Yes! There is a crazy fine line between getting stuff you don’t really need, and saving on stuff you’d buy anyways. The cereal is always such a huge savings when you combine coupons with sales and we’d definitely buy that anyways. 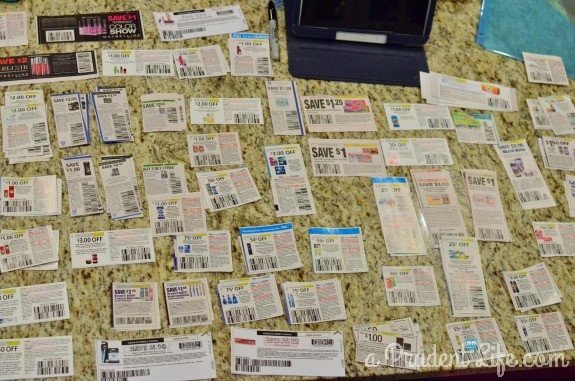 When I couponed, I so struggled with coupon organization. I tried a binder for a few years and I also tried a file folder system where I didn’t clip the coupons. 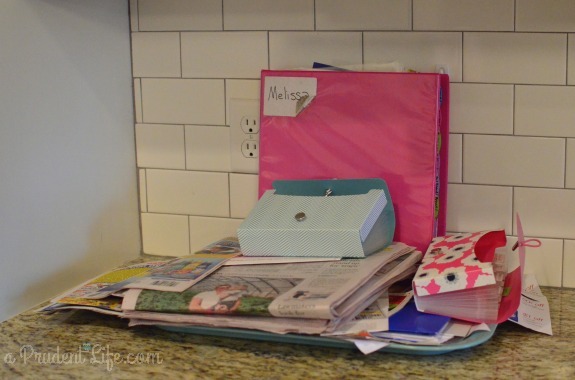 For me, the file folder was easier to manage but I always created such a huge mess when I went to go find the coupon in the insert and clip it, so I just started to avoid couponing. I’ve wanted to get back into it lately and may go back to a coupon binder. 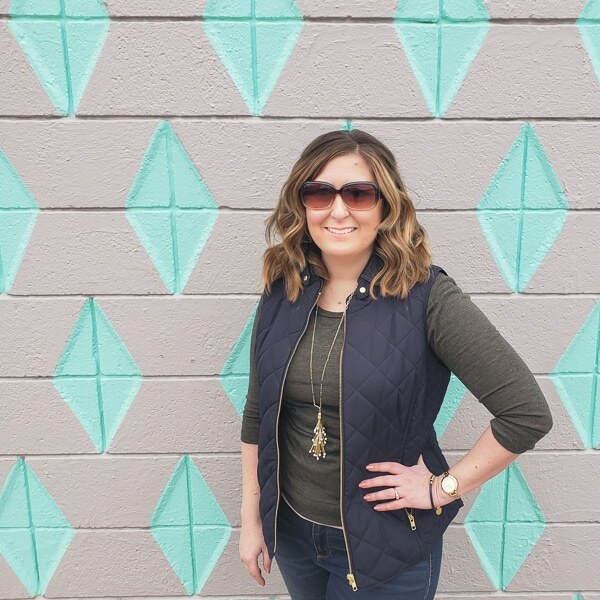 Great post and I especially love how cute your binder is! I wanted the filing to work so bad! I finally realized that it was ok to miss/skip some great deals. When I reduced the numbers of coupons I have to mess with, it is much more pleasant and easier to maintain. If I didn’t think I needed the product when I saw the coupon, why do I suddenly need it when it’s a crazy deal? I still clip some that end up not getting used, but way fewer. For example, every razor coupon gets clipped, but only the ones that have a good sale come up get used. I”ve been thinking about trying a binder again, I did a few years ago and didn’t like it; but your plan makes sense! Currently I have a little folder system like your divided up envelopes. I think it depends a lot on personal preference as far as which system you can stick with and make work. When I switched to the envelopes, they seemed so convenient, but I really missed being able to flip through the pages and see everything all nice and neat. In my head, the coupons in my envelopes were all going to be the same size and fit nicely, but they turned into a mess 🙂 I love that the divided sheet pockets force everything to be the same size. 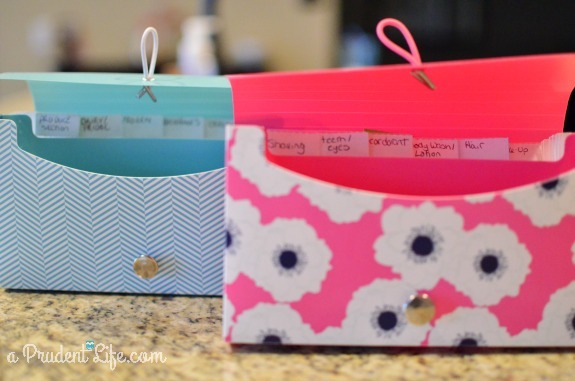 I use the divided envelope/organizer. They are inexpensive and work well, plus I can carry them with me if I am not sure what to buy. Stopped by from SITS Comment Love! Thanks for coming by Lynda! I’m all for using whatever works best for you! I so wish we had coupons in Australia! When I lived in the USA I really got into them and found the savings awesome. I miss grocery shopping and the awesome American prices the most! So expensive here. I love your blog, it’s just gorgeous. Well you learn something new everyday – I had no idea they didn’t have coupons in Australia. Such a bummer combined with the high food prices! Thanks for visiting my blog! I really like the binder idea! I just use a pouch and forget to bring it to the grocery with me most of the time. I need to give myself reminders. Thanks for sharing. You sound like me with my reusable bags. I’m getting better, but still forget them at home or in the car sometimes. Thanks for visiting! Thanks for sharing this at Hit Me With Your Best Shot…Can’t wait to see what you’ve been up to this week! I’ll have to try this! Too bad the envelope dividers didn’t work, they’re cute! I wish I was able to find more coupons for the stuff we use though. 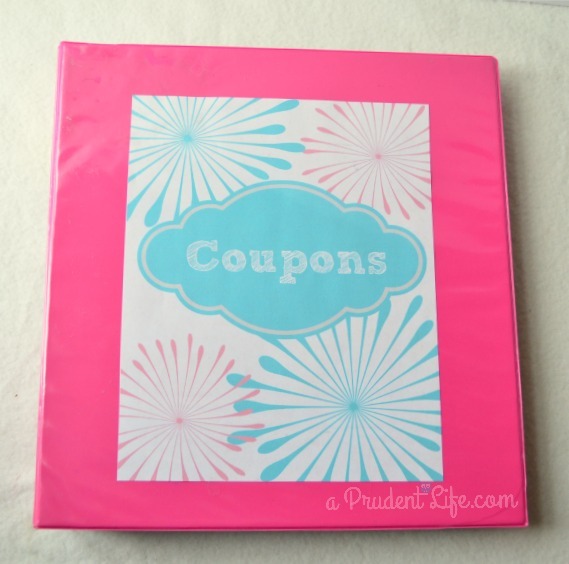 Do you have a free printable for your coupon binder front? It’s so pretty with that pink notebook. Where do you find the baseball card pockets? 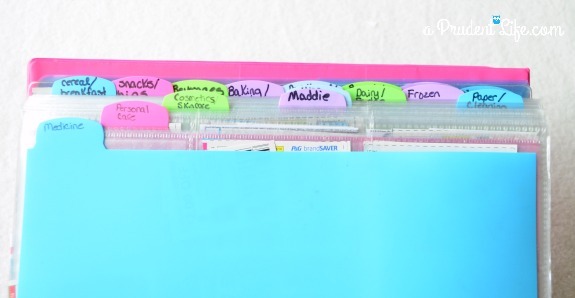 With the large binder like yours, it would be nice to be able to use it to mark off things you are buying off your list. I know my DH would be embarrassed if I took a notebook like that in the store and started pulling out coupons..He has mobility problems and rides in one of the electric carts in the store and I’d love to go to the grocery store without him because he runs up my bill with all the sweets he puts in the basket that he’s not supposed to have because of being Type 2 diabetes. I try to keep my cost down and not buy a lot of extra but sometimes he does think about things I should have put on the list and didn’t.. I am the sole driver now and sometimes it really is a disadvantage. I try to get him out every other day or every 3rd. day if weather has been bad..I don’t need him to get depressed. He’s got enough problems and the more problems he has, the more stress I have. We try to go out for lunch or grocery store if necessary. After about 2 hrs. he’s exhausted and so am I.
Hi Betty! I’m sorry, I didn’t save a printable for the cover, but I should have! Sounds like your DH is lucky to have you!